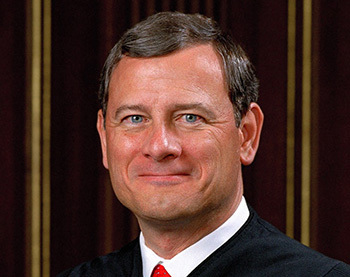 U.S. Supreme Court Chief Justice John G. Roberts Jr.
U.S. Supreme Court Chief Justice John G. Roberts Jr. has sided with conservatives in important Supreme Court opinions on campaign finance, gun rights and the Voting Rights Act. But his vote to uphold the Obama administration’s health care law has proved a sore point for some. On the one hand, Roberts is a longtime conservative who held legal positions in the administrations of Presidents Ronald Reagan and George H.W. Bush, according to reviews of a new Roberts biography by the New York Times and the Atlantic. On the other hand, he is concerned about the Supreme Court as an institution that is viewed as nonpolitical. Biographer Joan Biskupic calls Roberts an “enigma” who is pulled between his support for the court’s image and his desire to move it to the right, according to the New York Times review. Biskupic’s book is The Chief: The Life and Turbulent Times of Chief Justice John Roberts. In the case on the Affordable Care Act, Biskupic wrote, Roberts said he felt “torn between his heart and his head.” He backed strong limits on congressional power, but he was reluctant to interject the court into the health insurance debate. After an unsuccessful attempt to stake out a middle ground with Justice Anthony M. Kennedy, Roberts turned to Justices Stephen G. Breyer and Elena Kagan. Roberts’ compromise decision upheld the health care law and its insurance mandate under Congress’ taxing power but not under its commerce clause authority. The Atlantic deems Roberts the “anti-Kavanaugh” for his behavior as a young man. Roberts also attended a Catholic prep school, but he “had no time for drinking parties.” After graduating from Harvard Law School, Roberts clerked for Circuit Judge Henry Friendly and Supreme Court Justice William H. Rehnquist, whom he later replaced on the court. Roberts married his wife, Jane Sullivan, in 1996 when they both were in their 40s and he was in private practice. She is also a lawyer. They adopted a girl and a boy.